Mother’s day in the UK falls on Sunday the 18th March this year 2012. One of the traditional gifts for Mother’s day are flowers, and for a unique idea, how about giving flowers painted in Encaustic wax, these flowers will last and can be enjoyed for a long time. 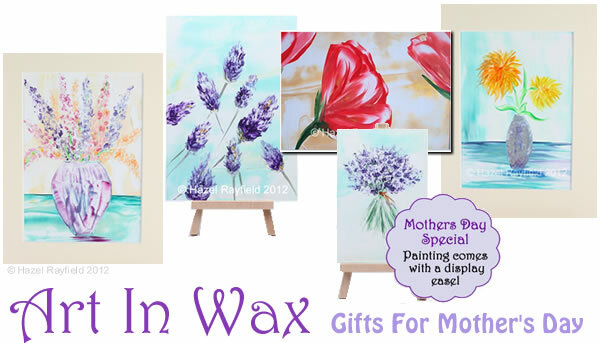 The Art In Wax shop has lots of paintings that would make wonderful Mother’s Day gifts, ranging from small 6 x 4 paintings to larger A3 size pictures. Some of the painting come mounted ready to frame and some come with a easel included as part of the current Mother’s day special. If you see a painting that you would like and would like to have a mount or display easel to accompany the painting please get in touch before ordering. From Lavender, Tulips and Delphiniums to Roses, Poppies and Pink Pretty Blooms, I have many paintings online here in my shop, also on outlet store Etsy, but if you don’t see the flower painting you would like then please contact me as I have other paintings not online yet and may have just what you are looking for.